The Alberta government announced Friday it will spend $10 million to hire more RCMP officers, civilian staff and Crown prosecutors to deal with rural crime. 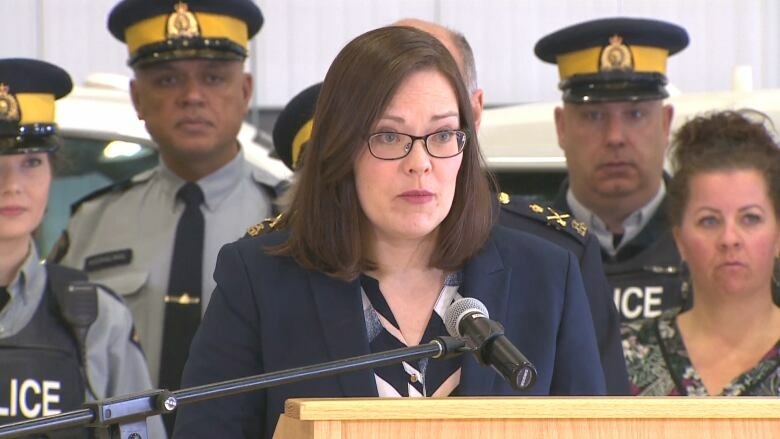 "Some communities in rural Alberta are experiencing the highest property crime rates they've seen in five years," said Kathleen Ganley, minister of justice and solicitor general. "This spike in criminal activity worries me." Of the money announced, $8 million will be spent to hire 39 new officers and 40 civilian staff, while $2 million will go to hire up to 10 additional Crown prosecutors, she said. "This money doesn't just represent a budget and a manpower increase," Ganley said. "It's part of an overall plan to enable police to work more effectively and more strategically." Rural crime has specific challenges, Ganley said. Criminals can target isolated properties without being seen, and RCMP have large areas to cover, which can slow response times. Brazeau County Coun. Kara Westerlund, vice president of the Alberta Association of Municipal Districts and Counties, said rural Albertans believe property crime is at an epidemic level. "Not only is the $10 million a welcome investment in supporting safe rural communities, but the accompanying list of initiatives reflect a strategic approach to protecting rural communities from criminal activity," she said. The minister announced a seven-part strategy to fight rural crime that includes establishing crime reduction units. The units will be made up of specially trained officers who will focus on arresting prolific offenders. As well, six additional intelligence-focused RCMP officers and four crime analyst positions will be hired to help identify high-priority prolific offenders and target organized crime groups that operate in multiple jurisdictions. "That means sharing information between multiple ministries, law enforcement bodies, and community partners," said Ganley. A policing support centre will be created and staffed by 23 civilian employees. The data centre will handle records management and routine data entry, which will take that "time consuming task" off officers hands, she said. "It means officers can spend more hours where they are needed most, in the community investigating and solving crimes." Many rural Crown prosecutors have heavy caseloads, so hiring additional prosecutors "will mean more timely access to justice," Ganley said. RCMP Deputy Commissioner Todd Shean says the announcement represents a significant contribution to the safety of Albertans. "I can assure you, if you are committing crime in Alberta, we will identify you, and we will stop you." Of the new funding, $8 million comes from the provincial government and $2 million from the federal government under the Provincial Police Service Agreement.